A/C systems are a bit mysterious, but super easy to understand and repair once you know what the different things do. At the center of it is the compressor. It compresses the refrigerant and sends it to a spray nozzle, and then collects the drainage back into the compressor. The compressor squeezes the refrigerant gas into a liquid. This releases a lot of latent heat, so this gas-to-liquid phase transition takes place in what is known as a condenser. 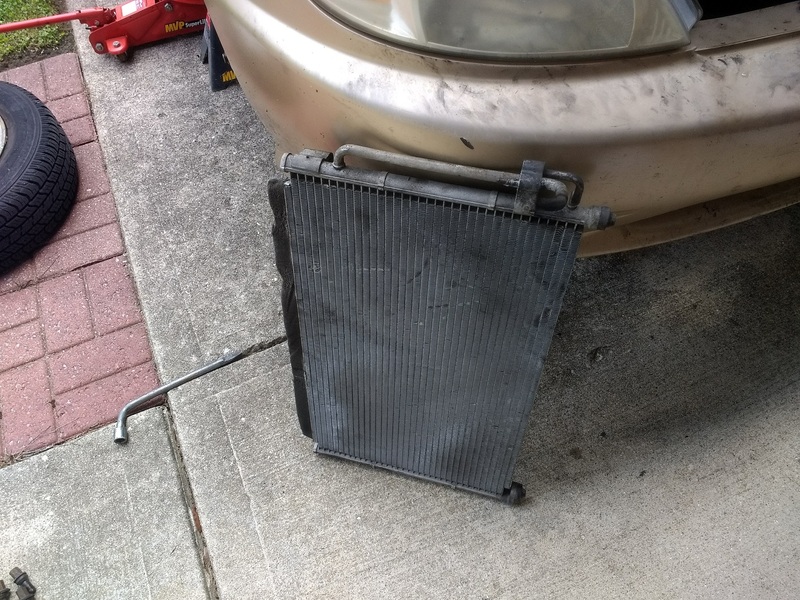 It looks exactly like a radiator so that most of the heat can be dissipated. The spray nozzle is known as the expansion valve, and is mounted on the firewall, usually on the passenger side. As the liquid refrigerant is sprayed, it will evaporate and cool. Therefore, this process takes place in the evaporator core, which is inside the passenger compartment attached to a blower fan. My compressor failed catastrophically one night. It totally seized up, and the drive belt burned up in a cloud of smoke. Whenever the compressor seizes up, metal shavings will end up into the downstream refrigerant lines. This means most of them will be stuck in the condenser and in the expansion valve, so these components should be replaced as well. Without it, the new compressor is almost guaranteed to fail (ask me how I know). 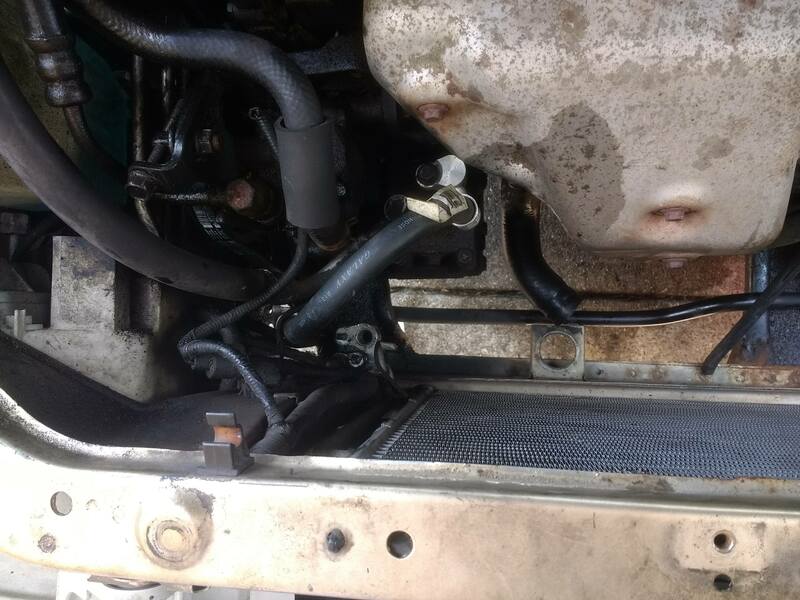 In order to remove the condenser, the radiator and its cooling fan has to be removed. There are actually two cooling fans. The fan at the front of the vehicle cools the condenser, and the rear fan cools the radiator. 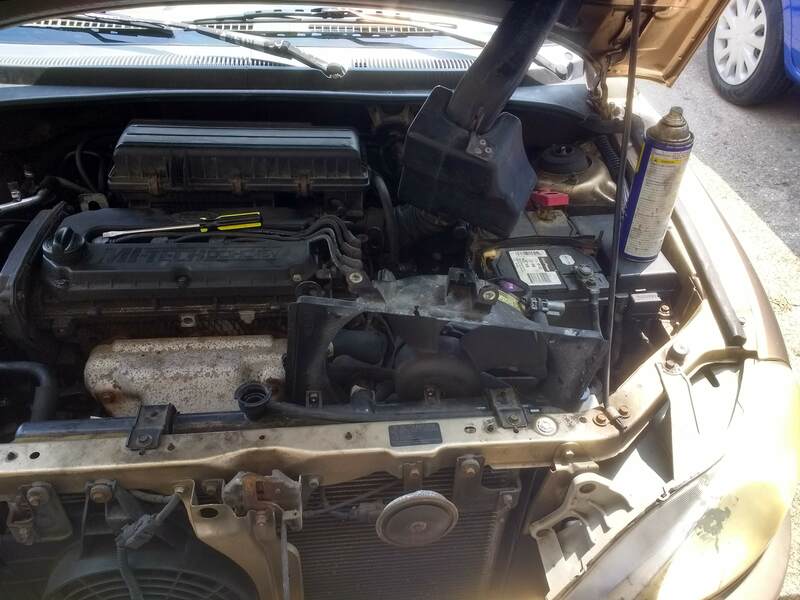 After removing the rear cooling fan, the coolant has to be drained from the radiator and its hoses disconnected (including the transmission fluid coolant lines). 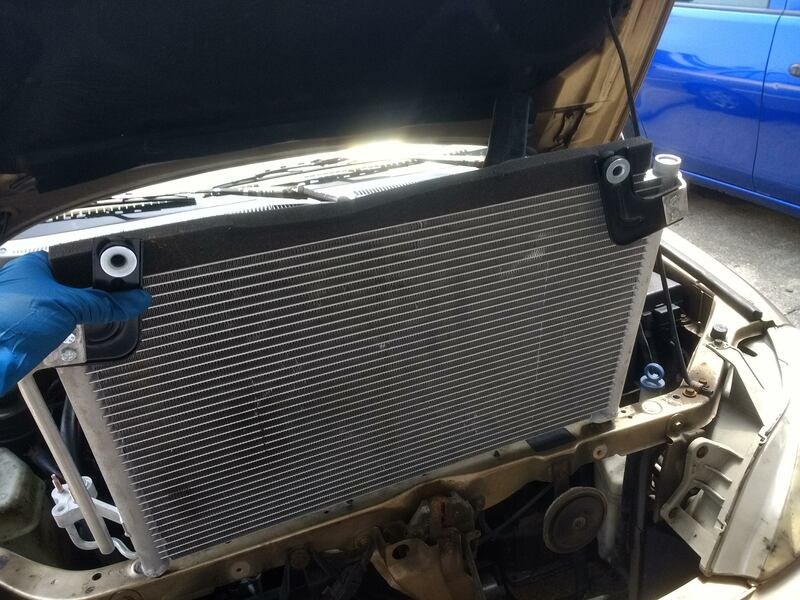 The condenser is sandwiched between the radiator and the front fan. ￼During installation, it is best to seal the compressor ports with some tape to prevent debris from falling in. Even small amounts of debris could be catastrophic for the rotating surfaces of the compressor. The new compressor usually comes with the correct amount of refrigerant oil, but the condenser may not. The expansion valve is relatively easy to remove and replace. All o-ring seals should be replaced at this time as well. Then the system is evacuated with a vacuum pump. Because the hole in the expansion valve is small, the system has to be pumped out from both the high and the low pressure sides. Additionally, since the refrigerant lines in the condenser are also extremely small, a long pump duration is necessary to pull all air out of the system- at least about one hour. Unfortunately, the vacuum gauges that comes with standard A/C manifold systems do not have enough sensitivity to show small changes in vacuum levels. It is not easy to tell if the system has reached its lowest vacuum level, or if it is still pumping. A useful trick is to pay attention to the sound of the vacuum pump when the isolation valve is turned on and off. If the system has reached its lowest vacuum level, and there are no leaks, there should be no change in sound. Even a small change in sound will indicate that there is a small flow coming from the A/C system. It may be hard to believe, but this process is far more sensitive than relying on the pressure gauge. The Rio takes 20 ounces of R-134a refrigerant. A standard bottle/can contains 12 ounces, so a little less than 2 bottles is needed. Walmart sells these for less than $5 each. 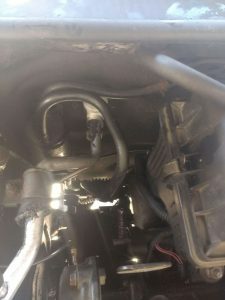 The standard technique is to disconnect the vacuum line from the pump after the evacuation, connect the refrigerant bottle, and purge the line with refrigerant by letting air out through the small valve located at the manifold. I was not happy with this technique because after spending all that effort to perfectly evacuate the system, we can still end up introducing air or moisture. 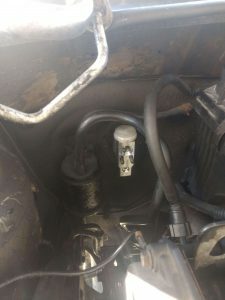 Here is a better way: Remove the valve at the manifold and connect a separate yellow refrigerant charging hose to that port. 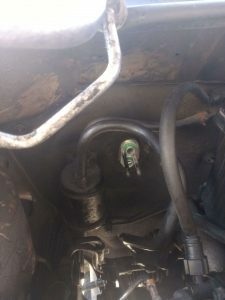 Connect the refrigerant bottle to the other end, but leave the bottle closed. When you evacuate the system, it will create a vacuum everywhere up to the refrigerant bottle. When evacuation is complete, close the valve at the vacuum pump, close the high-side (red) valve, and open (or pierce) the refrigerant bottle. This will start pulling refrigerant from the bottle and into the A/C system. 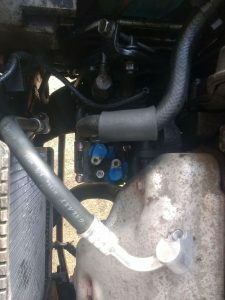 When one bottle is empty, close the valve at the low side (blue) inlet to isolate the A/C system, connect the new bottle, and run the vacuum pump again to evaluate the hoses. Evacuation should happen fairly quickly because you are only evacuating the hoses. Then start filling from the second bottle. Stop short of completely running the second bottle empty because you only need another 8 ounces from the second bottle. Alternatively, you can use a weighing scale, but I have not been able to get a reliable reading from the scale with the hose still attached to the bottle.